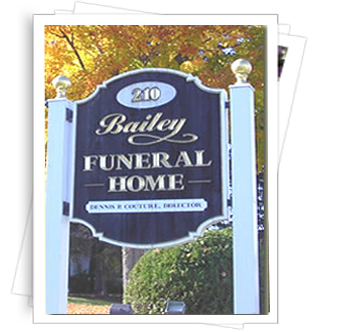 The Bailey Funeral Home was originally known as the Stanard Funeral Home and was purchased by Herbert and Edna Bailey of Peterborough, NH in 1957. They eventually changed the name and some years later their son Ronald N. Bailey came to work with them. In 1975 Ron purchased the funeral home from his parents and together with his wife Carol "Binky" Bailey, they operated the business until retiring in 1993. The funeral home was then purchased by Dennis & Pamela Couture of Colebrook, NH. Dennis has 35 years experience in funeral service. He is a 1982 graduate of New England Institute in Boston, MA, and is a licensed funeral director and embalmer in New Hampshire and Vermont. Ron has continued to work with at the funeral home in a part-time capacity providing assistance whenever needed. Worthy mention has to be given to the many family members and friends who assist at a moments notice and help us provide the utmost in service that is necessary for the day-to-day operations of a funeral home.